No one wants to hit their head against a stone wall. “When things go wrong, as they sometimes will…” (Don’t Quit Poem – author unknown), how will you choose to respond? The foundation for achieving our goals is based on the depth of our true commitment. When I look back at my own failures, I realize that I was lacking in the total inner commitment that is required to achieve the desired outcome. I recognize my ‘old self’ in some of my affiliate referrals when helping them out with their website or a marketing question. They “love” the idea of creating a successful online business and making it happen, but not so much the actual effort it takes to achieve it. To achieve our goals, we must go beyond the “idea” stage and take consistent and persistent action towards our goals. Never giving up does not mean we cannot change direction. Sometimes we have to know when to accept a disappointing outcome. 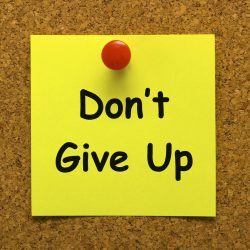 This does not mean that we quit – it means that we gather our strength and move on to find another way. A friend shared the Don’t Quit Poem in our community. The following is an extract of the last stanza. If you are looking for more motivation and inspiration, you will find various renditions of this poem on YouTube, set to background music, readings and imagery. As long as you are fighting to reach your goals, you are a winner. I hope these words empower you to go for it and make it the best journey ever! Hey Jude, I loved the message in the poem! What if I’m really so near to massive success? It’d be a shame to quit now! And simple thoughts like these are the ones that encourage me to just keep pushing forward so chin up because I think we all have thought about it before. I think it’s just part of the journey, if Internet Marketing was really easy, everyone would be doing the same! Sergio, I’m glad you liked the message in the poem. Most people who quit usually do so because they come to realize that the internet is not the magic money-making machine that the hype would have them believe. It is a rude awakening. Some people brush themselves off and become even more determined. Others quit. I appreciate your visit. Best wishes for your continued internet journey. What an inspiring message in that poem and what you have added. I enjoyed reading this. I think back how far I have come in a year and although it is nowhere near where I would like to be, it is less of a problem than it was a year ago. Mary, so nice of you to drop in. I know how busy you are these days, so much appreciated. Glad you found this inspiring. If something in your life is less a problem than it was a year ago, I’d say that’s progress. Congrats! Thanks for stopping by and your input. Wishing you continued progress in the year ahead and beyond. It truly motivates me to continue working towards my dream of someday owning my own home business. Nothing worth doing is ever easy! Jonathan, you have a great website and your love of everything “poker” comes through. I predict you will do well with it. I’m glad you know not to quit! Keep doing what your doing. You are definitely on the right track. Thanks so much for stopping by and leaving your comment. I appreciate it. Many times it has crossed my mind to either quit blogging due to seeing lack of results and my network marketing business due to be told “No” by people. It can be hard to combat the negative forces at work but we must learn to beat them down with a stick and keep moving forwards, one step at a time. Most successful people have “failed their way” to success and it’s their failures that have lead them to where they are now. Absolutely, Neil, I agree. Persistence is the key and failures are but stepping stones to success. I appreciate your stopping by and commenting – thanks!